The Castle Class 4-6-0 is one of the most celebrated locomotive types of the former Great Western Railway. The prototype, No.4073 “Caerphilly Castle” rolled out of Swindon Works in August 1923, the first of a series that remained in production right up to 1950. No.4079 “Pendennis Castle” was the seventh of 171 Castles built and was completed at Swindon in February 1924. Pendennis Castle's claim to fame dates from 1925 when the GWR lent the locomotive to the London & North Eastern Railway for trials against Sir Nigel Gresley's mighty new Pacifics exemplified by No.4472 “Flying Scotsman”. Working 16-coach trains on the East Coast main line from Kings Cross, the stalwart Castle covered itself in soot and glory, thoroughly out-performing its larger competitors. Its exploits were the talk of every schoolboy in Britain and the GWR rather cheekily sent “Pendennis Castle” to stand alongside “Flying Scotsman” at the 1925 British Empire Exhibition at Wembley with a notice proclaiming it to be the most powerful passenger express locomotive in Britain. After withdrawal in 1964, “Pendennis Castle” was purchased for preservation by Mike Higson and appeared at one of the Great Western Society's first open days in 1965. It was soon sold to the Hon John Gretton and Sir William McAlpine and was based at Didcot just before the GWS established Didcot Railway Centre. In 1977 the locomotive was sold again, this time to Hamersley Iron - one of the largest iron ore producers in Australia - for use on excursion trains on the company's 240-mile ore-carrying railway in the Pilbara region of Western Australia. No.4079 left England on 29 May 1977. In Australia, she was looked after by the Pilbara Railways Historical Society, formed by Hamersley employees, and worked many excursion trains through the Chichester Ranges. A highlight of the Australian sojourn was a visit to Perth in 1989 to operate alongside her old rival “Flying Scotsman” as the climax of a tour during the country's bicentennial celebrations. However, vastly increasing traffic on the Hamersley railway combined with operational difficulties resulted in No.4079 being stored out of use for several years, her final steaming in Australia taking place in October 1994. With prospects for an operational future in Australia looking uncertain, Hamersley Iron began to consider the options. The main concern was to find a new home that could offer a secure future, which would recognise the significance of its English heritage and provide a high degree of public accessibility. It was also important that the engine should not become a stand-alone exhibit, but should play its part in illustrating the wider picture of GWR locomotive development. The decision to offer “Pendennis Castle” to the Great Western Society was made in the first days of 2000. In return, we agreed to arrange and pay for the repatriation, and to restore her to full main-line running condition. The locomotive was formally presented to the Society by Hamersley Iron on 19 April. Following a 10-week voyage “Pendennis Castle” finally regained British soil on 8 July 2000, 23 years, 1 month and 8 days after she left. The cost of bringing the locomotive back to Britain had been met by generous donations from British enthusiasts and a grant from the Heritage Lottery Fund. “Pendennis Castle's” route was via the Pacific Rim, the Panama Canal, the Eastern Seaboard of the USA and across the Atlantic - the opposite way to her outward journey - making No.4079 the first 4-6-0 steam locomotive to circumnavigate the world, and only the second steam loco to do so after “Flying Scotsman”. There's no doubt that the repatriation of “Pendennis Castle” has warmed many hearts that were saddened when the engine left for Australia. Its contribution to the status of the Didcot collection is beyond question and future generations of preservationists will have good reason to remember the generosity of Hamersley Iron and Rio Tinto with gratitude. 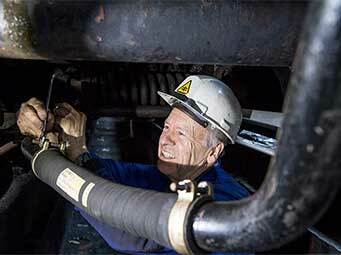 Paul Longworth fitting flexible parts of the vacuum brake hose at the front of the locomotive. The recent progress on 4079 ‘Pendennis Castle’ has been and continues to be in the cab. We have been slowly working through the various controls and valves and there is beginning to be a healthy majority of overhauled components finding their way back where they belong. The back head cladding, while largely complete, is in poor condition and a small group have been tasked with returning it to its former glory. We have taken delivery of the first batch of components that have been made up for us to start the reconstruction of the live steam feed pipes that sit between the superheater header and the cylinders. These are now in store pending the final boiler lift, as the boiler as it sits right now is a little too far back to accurately use the engine itself to set them up to a great degree of certainty. The fabrication of these will form part of the final tranche of boiler work when the unit is finally fitted again. Another big focus for us has been pipework with the remaining copper, rubber and steel parts being assessed, replicated and / or repaired as required and then fitted to the loco to provide a visual check on the progress. The coming few months will finally see the beginning of the installation of the main line equipment, for which we must complete the last round of fundraising. We are hoping to kick off the fundraising efforts by gathering as many people who have direct or family connections to the locomotive either in service or preservation at Didcot Railway Centre on Saturday 25 May. We have already confirmed the attendance of her last fireman in BR service and veteran of the famous 9 May 1964 run, Doug Godden.